So, as a rule follower (and breaker!)…. not going all the way, and not starting.” Buddha. 2. 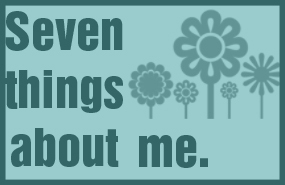 Share seven things about you. I’m a Mom, Wife, Daughter, Sister, Aunt, Teacher, Blogger and Friend. I adore reaching out to others via greeting cards because I think it’s important to show appreciation to others. I’ve had 7 surgeries so far in the last 10 years and I’m scheduled for my next one at the end of this month! I used to live in Spain. If I could, I would go out to eat every night of the week! As a Mom of two amazing sons, Kimberlee writes of the beauty and struggles of raising sons with autism. Her recently written & produced play, “Raising Autism” will pull at your heartstrings ~ Kimberlee juggles many hats while continuing to proactively raise money for POAC, finding joy in her children’s triumphs & supporting others all while writing her amazing blog! She was the first blogger I ever followed…even if autism isn’t a part of your life, you’ll find love, chocolate, wine and friendship with Kimberlee. Rhonda’s photographs, funny posts and great outlook on life will keep you smiling from ear to ear! You’ll especially love her bits of #2 in the potty world posts ~ you may even P your pants in laughter! She’s keep you on your toes ~ reminding you gently to use your common sense ~ so make sure you follow her! Bonnie’s history in hospice makes her the ideal person to make memory bears for your loved ones. Her gentle, caring ways are evident in her posts and by the bears that she so cleverly makes with love. Check out her site ~ it’s a keeper! Holly Michael is a Christian writer and author who wants to connect everyone to inspire and share our lives and writings. She has many categories to choose to read from and enjoy! Take a moment and follow her crooked lines and connect the dots! You will enjoy every moment! Please stop by the above treasures and enjoy them as much as I do! Surely you will be adding them to your list to follow! Thank you again Magnolia Beginnings ~ I am so grateful!